Is Cat Food That Contains Corn Gluten Healthy for Cats? Avoid cat foods with corn gluten meal. Walk into any pet store or grocery store and you'll find several cat food choices. You'll also notice a wide range of prices. Be careful about choosing the least expensive option, as it may contain corn gluten meal. This cheap ingredient may make your cat full, but won't make her healthy. Your sweet, cuddly feline friend is descended from a wild African cat. Her ancestors survived, and her distant relatives survive today, by hunting and eating what they catch. Cats are, and have always been, obligate carnivores. That means that they must eat meat to live. Cats can't survive as vegetarians. Meat is vitally important to cats because their bodies can't make several essential amino acids found in the meat. And while some animals can store these essential amino acids, cats can't. So they must regularly get these important ingredients from the food they eat. Without them, your kitty may develop serious health issues like heart disease and diabetes. Corn gluten meal is a cheap filler ingredient in many cat and dog foods, and is also used as a food for livestock. It is the leftovers from processing corn into corn syrup and sweeteners. Many pet food companies buy the corn gluten meal from large corn syrup and sweetener processing plants. Pet food companies add corn gluten meal to increase the overall protein levels of the food. It also works as a binder to help dry kibble keep its shape. Cats can eat corn, but they get very little nutritional value from it. Even though corn gluten meal does have protein, it's not the kind of protein that cats can use very well. Cats have to eat twice as much corn to get the same amount of protein that they would from meat or egg protein. Even if your cat eats enough corn gluten meal to get the protein she needs, she probably won't be able to use very much of it. Corn takes several hours to digest, even for people. But cats have the short digestive tract typical of carnivores, so food has to be broken down quickly before it's gone. Unfortunately, your feline friend will spend a lot of energy trying to digest the corn before she leaves it for you in the litter box. Aside from being a poorer-quality protein source, corn gluten meal poses some health risks for your cat. In the wild, a cat's diet would only be 1 or 2 percent carbohydrates. Dry food containing corn gluten meal ranges from 35 to 50 percent carbohydrates. Since cats can't really break down carbohydrates or use them for energy the same way people do, excess carbohydrates can lead to obesity and diabetes. Corn is one of the most common food allergens for cats. 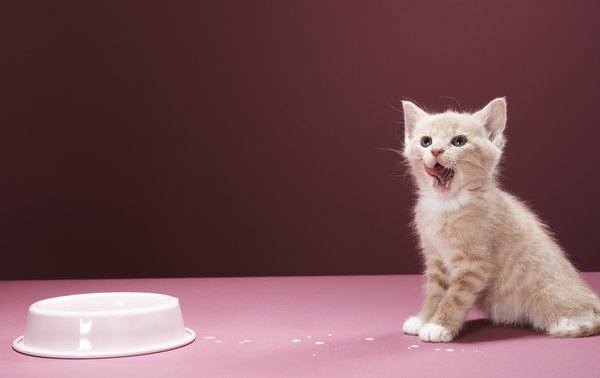 If your feline friend is allergic to corn, feeding a food with corn gluten meal could cause stomach upset, nutritional deficiencies, or even more serious problems like inflammatory bowel disease. You kitty may also start to lose her hair, develop sores and scabs or constantly scratch. Is Cat Nip Bad for Cats? Do Cats Need Annual Wellness Exams?